REPLACE THE OLD SERVER ENVIRONMENT WITH A WHOLE OF BUSINESS PLATFORM.. DESKTOP AS A SERVICE. Com2 Communications has partnered with a world class Citrix Desktop as a Service (DaaS) provider to be able to deliver your future working environment that was designed for some of Australia’s most successful companies, but is now delivered in a SME pricing structure. This platform is designed to completely replace the traditional on premises server environment and brings together Citrix, Microsoft Office and all of your own specific business applications in to a secure, resilient and robust system that will radically change the outlook of small & medium sized business for ever. DaaS allows you to access business email, Microsoft Office products and business critical applications from ANY device, ANY where! 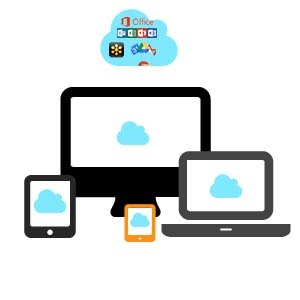 With the flexibility to use any PC, Mac, Apple, Android or internet connected device of choice, Bring Your Own Device (BYOD) is a real possibility. Throw away the shackles of an office, your employees can work from anywhere on any of their own devices whilst your business data is kept secure. FACT: Staff who can work from anywhere are shown to be more productive! One simple monthly fee, its that easy! With our Desktop as a Service product, your IT costs become predictable because they are part of the one monthly fee! No more unexpected IT expenses, no more unreliable IT people, we take care of the management of the programs and applications so you can focus on working on your business! Save TIME & MONEY with DaaS from Com2! Keep your IT budget on target with predictable expenditures. Our DaaS product is an end to end managed hosted environment that takes away the requirement of managing IT infrastructure. This in turn frees up IT staff to work on strategies that grow and develop your business which in turn reduces total cost of ownership (TCO). With our DaaS solution, your business will have virtually no need for large capital expenses on servers or backup infrastructure. The inbuilt scalable design of our platform means you can invest your financial resources back into growing your business rather than procurement of additional hardware..
By removing servers and infrastructure from the office, there is a reduction of cost that is associated to running all the idle servers 24/7 as well as reductions in cooling costs. With every square meter costing dollars, you will also be able to save space! With the hosted desktop suite of Microsoft office products, software updates are all completely managed within our service. No more IT management of licensing and expensive annual IT upgrade costs, just sit back and let the team manage this for you! If there are software upgrades to your own in-house software, many of these can be done with a simple email request to the service team and like all the above…. It will be taken care of for you. What is your Data Disaster Recovery (DR) Plan? With state of the art active/active desktops, risk is kept at an all time low! 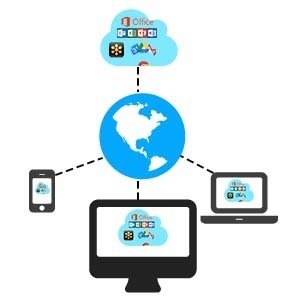 Not only do you have control of your data, but your data is alive in more place than one. 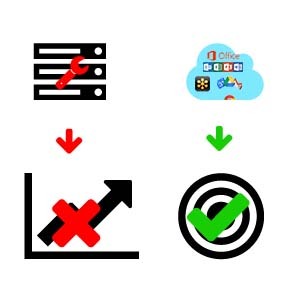 Our DaaS solution is hosted in multiple Australian Data Centers which means your data will always exist in more than one place, and if your primary access point goes off line, then the replicate site automatically cuts in, allowing you to pick up from where you last saved, minimizing data loss and maximizing business continuity and uptime. Your data is your data!! Security is our Priority! Unlike offshore Desktop as a Service providers, the offering from Com2 is built on Australian servers in Australian data centers. This means Australian data laws protect them. Your data connection from Com2 makes sure the Internet link between your business and the hosted desktop service is private. In addition to this, your intellectual property is even more secure! Our platform can allow you to control individual users at the check of a box to stop any critical business intelligence leaving the network and therefore your business. Data protection and data sovereignty in one application give you peace of mind. With data centers requiring multiple layers of identification including swipe cards, video surveillance, biometric scans, your data has never been safer! With the same level of encryption and security as a bank or financial institution, your data is safe whilst it is on the move! Private data links add maximum security. Your data is completely isolated in a tenanted environment. It’s only accessible by authorized users. You control the data and access at all times.